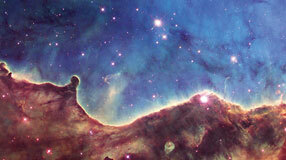 Part of a visual tradition that reaches back to Romanticism, Hubble Space Telescope images awe as they inform. Donald Rowley, SB'45, SM'50, MD'50, "a wide-ranging and imaginative researcher," dies at age 90. On walks across Mexico City, UChicago historian Mauricio Tenorio Trillo finds a path to the past. Film scholar Tom Gunning explains how editing conventions create the splice of life. The University's director of arts and public life describes the vision for a new Washington Park arts incubator. Professor William Irvine and postdoc Dustin Kleckner create the first knotted vortex, previously known to be theoretically possible, in a laboratory. Law professor Eric Posner says that samples should be collected from everyone--not just convicted criminals--to protect the innocent. President Robert J. Zimmer argues that, despite rare examples of dropouts who succeed in business, most aspiring entrepreneurs benefit from college. Professor David Archer notes that, even if fossil fuel use were to stop, CO2 would linger in the atmosphere for millennia. 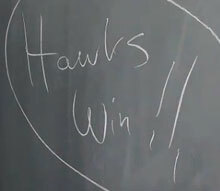 UChicago statistician Stephen Stigler runs the numbers to show that the Chicago Blackhawks' record-setting streak did not violate the laws of nature. 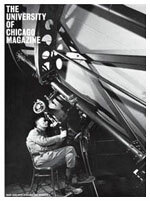 The Mar-Apr issue of the Magazine will be in your mailbox soon, and it's available now online, featuring a historian adrift in Mexico City, sublime images from the Hubble telescope, an alumna mortician, and more.